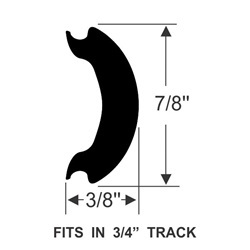 Dense Rubber Insert Trim for RV / Marine / Utility trim moldings. 7/8" total width. Featuring a proprietary EPDM rubber compound instead of vinyl or plastic to provide better protection against the elements, improved UV and ozone resistance, easier installation and better defense to impacts and scuffs.